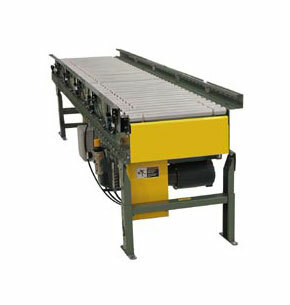 The Model 190-NSPEZ is a horizontal live roller conveyor designed for Zero-Pressure Accumulation of product. Positive braking in each zone reduces the possibility of damage to fragile items during accumulation. Singulation feature allows products to be removed from any location on the conveyor. Bed - 9-1/2" deep x 12 ga. formed steel channel frame powder painted. Rollers - 1.9" dia. x 16 ga. galvanized tread rollers spaced every 3" and an EZLogic® Accumulation Module located in each zone. Overall Frame Widths: 16", 18", 20", 22", 24", 26", 28", 30", 34", 36", 40", & 42". Motor - 1/2 HP standard - 2 HP max. Capacity - Maximum load; 15 lbs. per drive roller. No minimum load. Accumulation Zones - 12", 18", 24", 30", & 36" Long Air Controlled.